How good r u with noodles? Run this panda noodle shop and look after the customers, server 'em up the best noodles in the world. Mr. Bree has lost his memory and forgot the way home! Now you gotta help him to return home! For that, Mr. Bree needs to travel through the deepest and deadliest places, recovering his forgotten movement skills, and avoiding death at all cost while hoping to meet his family again. 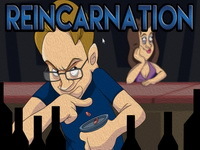 Reincarnation The Final Happy Hour is another sequel in the Reincarnation point and click adventure games series created by Christopher Gianelloni. Help the demon find the escaped soul and send him back to hell after making sure that soul has converted back to his old ways. OH NO! That fat kid is drowning in the pool! I guess Lifeguard Larry had better save him or at least get his corpse out of the pool or something. In this game you have one minute to take action. Your actions can all lead to different outcomes in this fast and fun, humor game. Whack baseballs out of the park and into people's houses! Break their stuff - with Sports Power!! Show them who’s boss. Click to kick your abusive boss out the window—time it right and he’ll really fly! Buy power-ups at the store to increase his flying time.